Euro-Gas Management Services Ltd: False alarms are not just a nuisance. False fire alarms mean downtime, loss of business and waste the valuable efforts of emergency services. If alarms sound regularly and unnecessarily, people lose confidence in the system. This could not only mean your business would be downgraded in response by the fire service but ultimately, could threaten life if alarms are ignored in a real fire or gas leak situation. All fires produce three common elements –Carbon Monoxide, heat and particulate matter. Multi-criteria based fire detection systems offer the most promising means to detect these elements, achieving both enhanced sensitivity to real fires and reduced susceptibility to false alarms. Multi-criteria systems are particularly crucial for areas with high volumes of people, including hotels, shopping centres and large office blocks. Where the costs of evacuation, disruption and downtime prove significant, as for airports or banks, multi-criteria systems are the only choice. The latest technologies incorporate a Carbon Monoxide sensor, a smoke sensor, a temperature sensor and a light sensor. Utilising gas sensors in combination with the more traditional type sensors holds the greatest potential for successful multi-criteria detectors. The fact that Carbon Monoxide (CO) is the causative agent in a majority of fire deaths, enhances the benefit of using CO as a fire signature for detection purposes. Given the toxic properties of CO, it can be argued that a "false" alarm due to the actual presence of CO, even in non-fire situations, is not a false alarm at all. Actually, such alarms are desirable in terms of general safety. Any technology that significantly improves life safety is a good technology and if it is cost effective, even better. ECO-Sure is a unique, high quality and low cost Carbon Monoxide sensor, specifically designed to meet the growing demand for CO detection. The sensor comes with additional benefit of a 5 year warranty for the standard ‘ECO-Sure’ version or 10 year warranty for the ‘ECO-Sure X’ version. ECO-Sure is particularly ideal for fire detection systems, residential CO alarms and car park monitoring systems. Using a unique, patented electrode configuration, ECO-Sure is designed to meet all the requirements of the latest LPC and VDS standards for fire detection using gas sensors, in addition to BS7860, EN50291, UL2034 and CSA16.9. 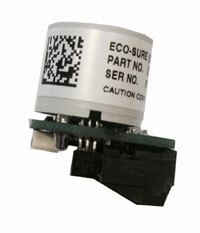 ECO-Sure gas sensors have a 5 or 10 year warranty under normal operating conditions. ECO-Sure sensors are amperometricand therefore require no power for operation, ensuring suitability in even the largest distributed systems where power consumption is of paramount importance. Simple, low cost drive circuitry helps reduce design time and lower final product cost.